Hubby and I like a little peanut butter in our chocolate fudge. 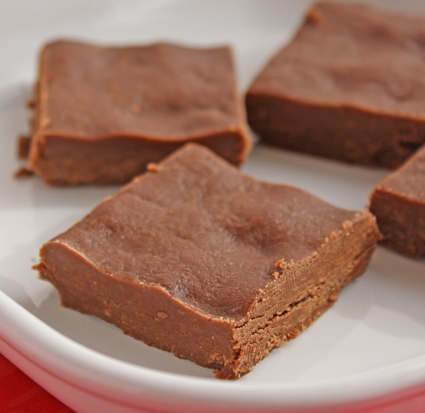 This holiday recipe makes a smooth and rich fudge and it's easy enough for a beginner; no cooking or thermometer required! Put peanut butter, ½ cup butter, and milk in a large saucepan. Heat over low heat, stirring constantly until peanut butter and butter are melted. Remove saucepan from stove. Add vanilla, sifted powdered sugar and cocoa powder. With a hand-held mixer, beat at medium speed until smooth. Turn out into the greased cake pan. Spread evenly with a spatula. Chill in fridge for one hour or until firm. Yummy variation: Add 1/3 cup chopped peanuts.